"Are you trying to commit suicide? I mean, just let me know if you are, because if you are, I've got better things to do with my time." Suspect is set in 1980s Washington D.C., where public defender Kathleen Riley (Cher) finds herself defending one Carl Wayne Anderson (Liam Neeson), a deaf and mute homeless man accused of a young law secretary's murder. When Anderson's trial gets underway in the courtroom of Judge Matthew Helms (John Mahoney) under prosecutor Charlie Stella (Joe Mantegna), dairy lobbyist and reluctant juror Eddie Sanger (Dennis Quaid) finds himself drawn into the case after hours. The courtroom drama is a tried-and-true genre, and Suspect is at its best in the judicial environment, where director Peter Yates' attention to detail and legal procedure lends the proceedings a convincing credibility (aside from a few cinematic compromises). Pacing is deliberate but never "slow," and Yates' willingness to let his actors work onscreen enhances Neeson's scenes considerably—his struggle to communicate provides a level of drama beyond any element of the creaky mystery plot. All of the performances are solid, though Quaid's charm occasionally seems to be on autopilot. Suspect's plot is neither innovative nor tremendously hard to figure out, though Eric Roth's intelligent script provides enough red herrings and smaller mysteries to keep things interesting. Some of the more intriguing issues raised are never explored in any serious way—the behavior of Quaid's unscrupulous Sanger remains unexamined, even as his independent investigation on behalf of the defense violates the law in a number of ways. 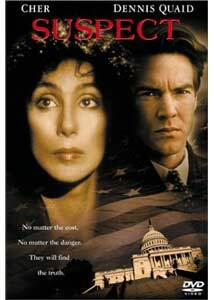 But the film works, thanks to solid performances by Cher and Neeson and Yates' attention to detail. There's a depth to the world of Suspect rarely seen in the murder mystery form; it's a refreshingly well-executed example of an admittedly limited genre. Image Transfer Review: Suspect is presented in its original 1.85:1 widescreen theatrical aspect ratio, with a fine anamorphic transfer; a 1.33:1 pan-and-scan version occupies the flipside. The film looks just great on DVD, drawn from a very clean source print, with sharp detail and naturalistic color (aside from a few harsh reds) that belie the single-layer transfer given this two-hour movie. Director Peter Yates mentions in his commentary how pleased he is to see the film on DVD, as close to his final theatrical cut as possible. I couldn't agree more. As always, the pan-and-scan full-frame version crops scenes noticeably and is not recommended (though I've seen more distracting P&S presentations). Audio Transfer Review: Columbia TriStar presents Suspect with its original Dolby 2.0 Surround audio track in English, with a variety of mono presentations in French, Spanish and Portuguese. The English track is largely centered, but a few key sound effects reach into the rears, and Michael Kamen's wonderfully old-fashioned score occupies the surrounds with subtlety and breadth. The stereo surround track is noticeably limited in dynamic range (especially during the opening, largely dialogue-free, sequence) but it sounds fine as presented here. The monophonic alternate-language tracks are clumsily dubbed and mixed, as per the usual, and are not recommended. Extras Review: Columbia supports Suspect with 28 picture-menu chapter stops, a bevy of language tracks (4 audio, 7 subtitle), and a few standard supplements. In general, the presentation leaves something to be desired—the Trailer is presented in 1.33:1 pan-and-scan, 2.0 mono format, and the Talent Files (covering the director and 5 stars) are just filmographies, with no biographical information. Director Peter Yates contributes a commentary track - his distinguished, seventy-year-old voice is pleasant to listen to, and he comes up with some insightful and interesting thoughts on the project. Unfortunately, while his remarks always seem well-considered, he has a tendency to go silent for extended periods, sometimes minutes at a time, making the commentary track a bit of a challenge to listen to in a single sitting. Suspect is a nicely crafted if predictable mystery thriller, enhanced by good performances and strong direction. Columbia TriStar's DVD features a fine transfer and a few worthwhile supplements. Worth a spin.